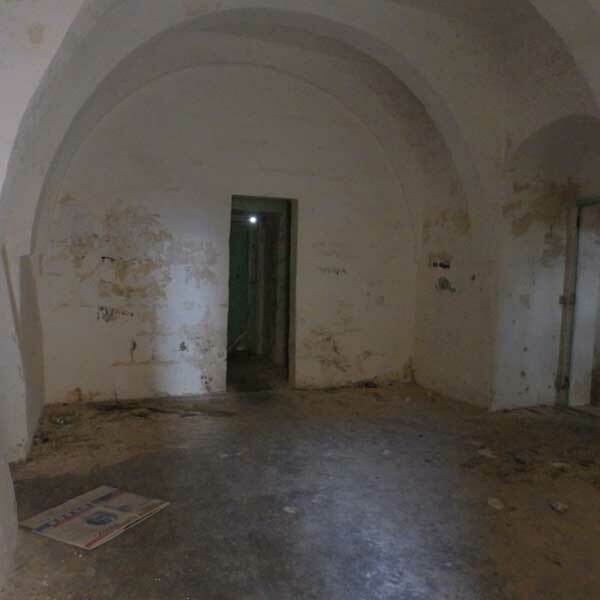 The tower built by Grand Master De Redin consisted of two floors, the ground floor used for storage of cannon balls and gun powder while to upper floor used as living quarters for the torriero or commander of the tower, three soldiers and a bombardier acting as reinforcement. The guards reached the upper floor by means of a rope ladder and climbed up to the roof by means of a spiral staircase. They accessed the ground floor by means of a rope or ladder. The external wall of the ground floor is scarped up to the cordon. A machicolation on the East side of the tower is remnant of medieval fortifications through which stones or burning objects/liquids were dopped on attackers. Some earlier towers, such as St Paul’s Tower built during the reign of Grand Master Wignacourt, had machicolations but this is the only one of the 13 De Redin towers which was built with one. Other minor defensive posts built during the period of the Order of St John include batteries, redoubts and entrenchments. In 1714 and 1715 reports were forwarded by Knights D’Arginy and Fontet accompanied by second Engineer Bachelieu. The works proposed had to be planned and supervised by expert military engineers. In February 1715 French military engineers headed by Brigadier Louis Francois d’Aubignè de Tignè and Charles Francois Mondion as Second-in-Command visited the islands to enhance the defences of bays. In April the Grand Prior of France, Philippe de Vendome joined the engineers. Tignè was in favour of strengthening the harbour fortifications in Cotonera, Sta Margherita, Ricasoli and Floriana. Vendome was more inclined towards the strengthening of the coastal defences and offered to donate money for their erection as well as a loan without interest. The latter strategy was preferred and adopted. A 1720 map by Charles Amadeus de Berey gives us a clear indication where these batteries and redoubts were located. This was during the reign of Grand Master Perellos. The Aħrax tower was strengthened with the addition of a blockhouse which still lies adjacent to the tower. It was further protected by the construction of walls with musket holes of which only part of one survives. A 1918 plan prepared by the Naval Authority shows the shape and position this wall had. One of these projected from the South East corner of the tower while the one which still exists projects from the North East corner of the tower. A ditch which was armed with 8 cannon, but with no embrasures, further protected the whole site. The blockhouse and battery cost 544 scudi, 11 tari, 10 grani, and 3 piccoli. These were spent on the walls of the counterscarp, smoothing of the rocks, excavation work, transportation of material and 4 arches of the blockhouse and feritori which in military terms means embrasures or musket holes. Close examination of the low parapet wall of the ditch does not reveal the presence of any embrasures but it is possible that these feritori were embrasures or musket holes in the redan walls which do not exist any more. The inside and the surrounding walls of the ditch were full of overgrowth, planted trees and some fruit trees. The trees were planted to offer more privacy to the tenants of the tower and surely not for military and defensive reasons! Din l-Art Ħelwa applied to the relevant authorities to clean the ditch overgrowth. The ditch is partly excavated in rock and partly built and the roots of the trees severely damaged the surrounding walls of the ditch. The upper floor of the tower can be independently reached via a staircase from an entrance on the South wall of the blockhouse. 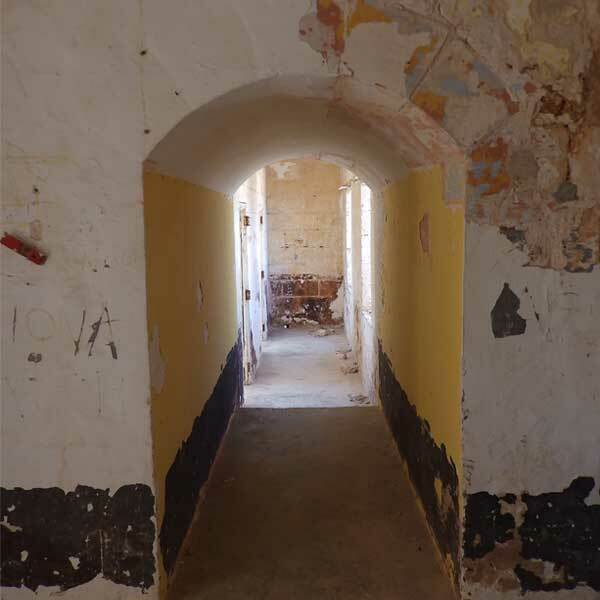 The blockhouse is in turn accessible from an entrance on the West wall and from here one can access the ground floor of the tower from an arched passage cut through the thickness of the Western wall of the tower. This arrangement allowed the building to be divided into two separate parts. Following the news that the plague hit nearby Messinas, in June 1743 Grand Master Fra Don Emmanuel Pinto sent inspectors composed of Jurats (one from the Universita` of Notabile and one from each Universita` of the cities of Valletta, Vittoriosa and Senglea) to report on the conditions of the coastal towers which by this time had lost their military role but assumed other equally important roles against smuggling and stopping anyone from landing against permission especially for security and sanitary reasons. From this inspection we learn that the tower was manned by a commander (torriero) who received a salary of 2 scud 6 tari monthly, three soldiers with a salary of 2 scud monthly and a bombardier acting as reinforcement. They were paid by the Universita`of Notabile and were under the command of the Senescalco in Valletta. It was noted that the tower was not provided with a bell and that the well was about 30 paces away. The tower was in a good state and had been pointed and white washed some time before the inspection. The tower was armed with 2 five pounder (French) bronze cannon, length of bore 6 feet, two inches 6 lines (French), diameter at the touch hole 11 inches 6 lines, diameter at the trunnions 10 inches (French), bore 7 inches 4 lines (French), two gun carriages which were unserviceable, 4 unserviceable trucks with two iron axles, 2 swivel gunsmith stand (Falconets), 4 muskets, 8 staffs with rammers and wooden sponges, 1 brass ladle for gun powder, 1 worm to extract wadding and gun powder, 1 hand-spike to traverse and elevate guns, 1 vice, 4 beds, a flag pole, 16 iron cannon balls, 1 rotolo fuses, 1 retolo lead bullets, 10 rotoli gun powder and 2 arm stands. In 1770, the battery was armed with ten 12-pounder iron cannons and it was suggested that three of them be replaced with three 24-pounder cannons together with the tools needed to fire them, two of the biggest bronze mortars together with their 30 bombs, 700 iron cannon balls and 150 grapeshot. An amount of gunpowder was kept at the Red Tower in case of need. In 1800 the islands of Malta, Gozo and Comino fell under British rule. After the Battle of Waterloo in 1815, when the French army under the command of Napoleon was defeated, the Maltese Provincial Battalions, the Malta Coast Artillery and the Battalion of Maltese Veterans were disbanded and an infantry regiment called The Royal Malta Fencible Regiment was formed. Lieutenant Colonel Count Francis Rivarola was entrusted with raising the regiment. In March 1828 he reported that the White tower required attention particularly after the bad weather that afflicted the islands in the winter. Interesting to note is that in this report he refers to the tower as ‘Tower Biancha’. Being an Italian name, this could well mean that the tower was called so even during the period of the knights and was later on referred to as the White Tower. It required pointing, plastering, carpentry work as well as supply of chairs, tables and oil lamps. 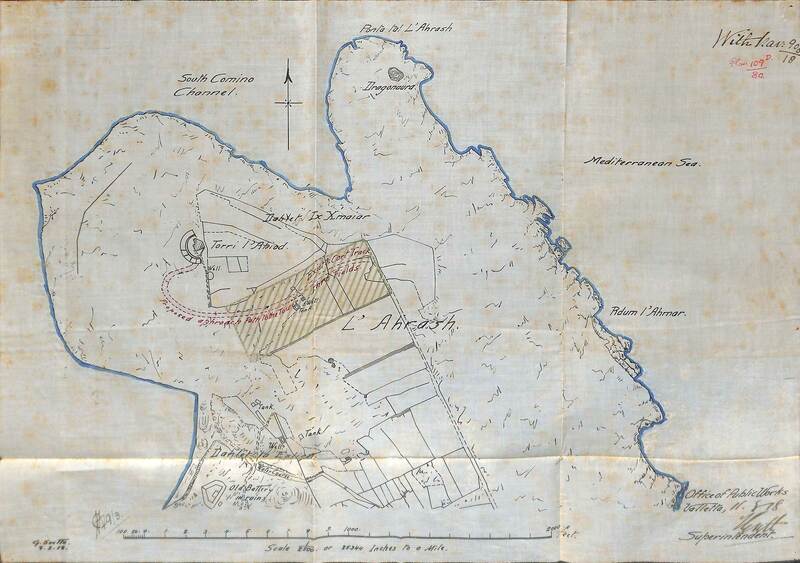 A detailed map drawn by Don Felice Cutajar, a Maltese priest, and dated 1833 gives us the names of the coastal towers, batteries, entrenchments, redoubts and curtains with the quantity of guns to be found in the coastal defences. In this map, the Maltese priest noted that the tower was still armed with 2 cannons and the surrounding battery with 8 cannons. We still hope to find some of the cannons buried somewhere around the tower! Until 1918, when the tower was handed over to the Naval Authority, the tower was manned by the Military Authority with the primary aim of preventing smuggling as well as stopping illegal landing of unauthorised people for defence and health issues. The request for the White tower to be handed over on long lease to the Naval Authority was done on 15 February 1918 following tenders which were called for by the Director of Contracts. They also requested that a cable be laid to the sea and that a road laid leading to the tower (marked in dotted lines in the plan). The transfer from the Military to the Naval Authority was made on encroachment terms as the tower was to be converted into a Naval Instrument Station. It was stated that ‘the building will require to be thoroughly repaired and considerably extended, an approach road constructed…’. The approach road passed through a plot of land held on long lease from the Government by Gio Maria Borg nicknamed ‘Ta’ Ghokos. It is interesting to note that the plan of the tower indicated how the redan walls were built to enclose the tower and battery. Today only part of the northern wall of the redan remains. It could well be that the stones of the rest of the northern wall as well as the southern wall were used to build the room in the ditch as well as a small room behind the tower as these additions are built from big stones form the Knights’ period. In fact the room is not depicted in the 1918 map while it is included in a later map. It was transferred to the Naval Authority in March 1918 on encroachment terms and was converted into a Naval Hydrophone Station. A floor was constructed upon the blockhouse and some rooms added on the roof. In July 1922 a request by a Maltese citizen to take the tower and adjoining land on lease was refused as it was still being used by the Naval Authorities. At that time the tower was ‘in perfect maintenance’. At a time when many of the coastal towers were transferred to the Civil Government, leased to private individuals, turned into kiosks or police stations the White tower continued to serve its military role as its location was too important to abandon it. Originally an instrument to locate icebergs following the Titanic disaster, the first hydrophone was invented in 1914 by a Canadian Reginald Fessenden. It was improved by a Frenchman Paul Langevin and a Russian Constantin Chilowsky who invented an ultrasound transducer. A thin layer of quartz between two metal plates detected sound waves and could determine the distance and direction of an underwater object. During the war it was used to detect U-boats getting close to the coast or even submarines. Eventually the Americans improved on this apparatus which was now able to detect U-boats at a distance of 25 miles. Hydrophones were still in use in WW2. Reference to a hydrophone listening station in Malta is made in the book titled, The German Submarine War 1914-1918 by R. H. Gibson & Maurice Prendergast (2003) referring to “an experimental station with a hydrophone training school was begun at Malta during the autumn of 1917”. This could refer to either St Thomas Tower or the White Tower, or to both. In the beginning of the Second World War the Military Authority took control of the tower again and constructed a room in the ditch of the battery. 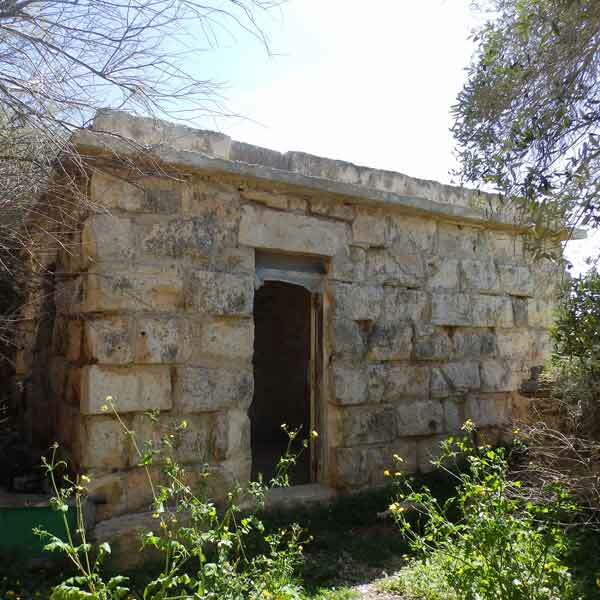 Another military post was also constructed at Ir-Ramla tat-Torri After 1947 it was leased to Sacred Heart Sisters for use by the nuns as well as the students of the Training College, and later on to various individuals till around 2004 when it was abandoned. The roof of lower floor is supported by three arches while the upper floor has a vaulted roof which allowed heavy artillery consisting of two cannons to be mounted on the roof. The roof has a turret in one corner and a parapet all round.